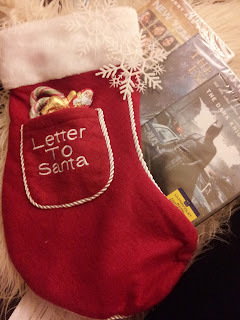 The people at Warner Bros. must have known I needed a break as a couple of weeks before Christmas a lovely parcel arrived from them with some yummy chocolates (which unfortunately did not survive the walk home from the post office - nom nom) and some DVDs. There was one for each occasion and I got to enjoy a cuddle on the sofa with the bloke and the newest Batman film, a girly night in with New Year's Eve and some precious family time with The Polar Express. Christmas is the most stressful time of the year, but also the time we put most emphasis on time away from work and time spent as a family so the Dvds were a great excuse to enforce this. Batman: The Dark Knight Rises was my favourite of the three and as I hadn't got round to seeing this one at the cinema it was great to finally catch up! Following on from the fantastic Dark Knight, this film sees Christian Bale complete the trilogy of Batman films with a bang. I won't give too much away but there is plenty of action and lots of moments where popcorn is an absolute necessity! New Year's Eve was a typical girly film in the same style as Love Actually. It has so many big names in it from Sarah Jessica Parker to Ashton Kuchter but I didn't find it lived up to the British classic unfortunately. That said, I did have a lovely night with a big bar of dairy milk and I may have welled up a little at times - blaming the pregnancy hormones here! The Polar Express is a lovely Christmas film and although Dylan certainly doesn't have the attention span for a feature length movie yet, he seemed to enjoy the bits he sat still enough to watch! Mummy and Daddy both loved it too which I think is important in family films and it will definitely be on our pre-Christmas play list ever year to help get us in the mood! Nothing beats a nice snuggly night in with a film and with snow forecast across the country this weekend I would definitely recommend these films. Obviously chocolate is non-optional. Disclaimer: I was sent this lovely package from the people at Warner Bros. but all thoughts and opinions are my own.